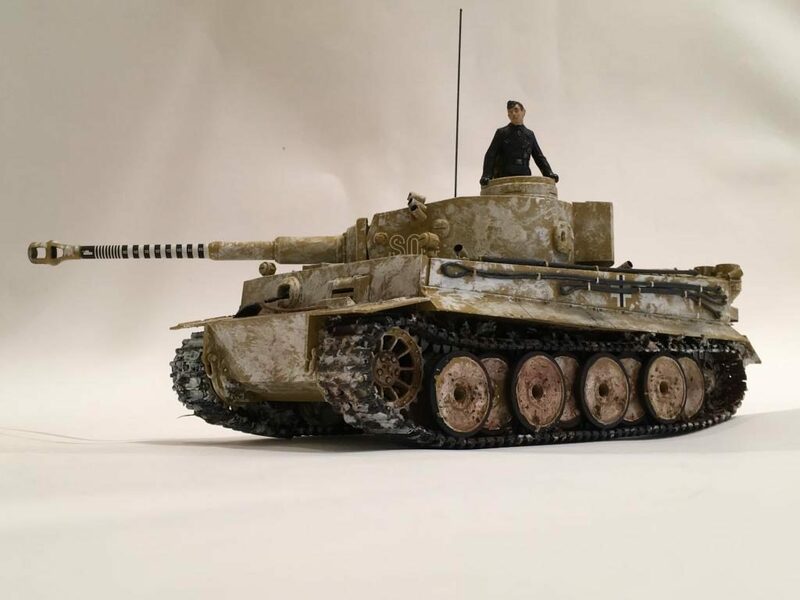 Here’s a few pictures of one of my earlier Tiger builds. This one was built about 10 years ago. I used the available Tamiya brand individual track links for this build, since I’m not a big fan of the one piece vinyl ones that came with the kit. I also used the Tamiya photo etch for the rear upper deck screens. Other than that it’s pretty much built right out of the box. 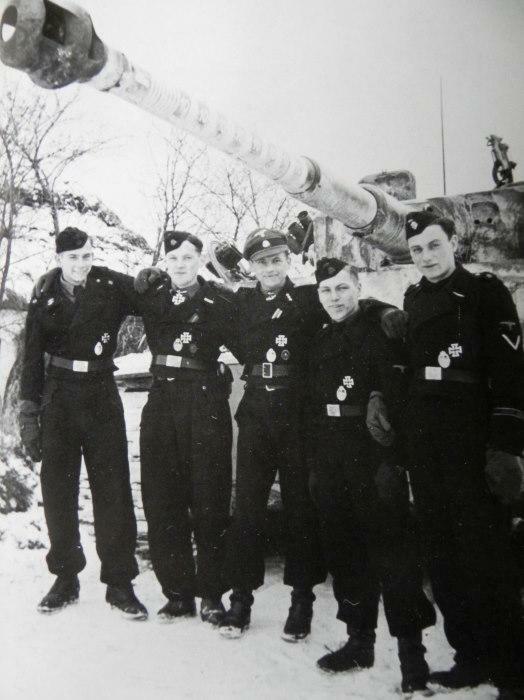 Some distinguishing features of the “Early” Tigers are the lack of “Zimmerit” anti magnetic mine paste, “Fiefel” air cleaners that were often easily damaged, twin Notek driving lights mounted high on top of the hull, grenade dischargers, the main gun mantlet, and the way the tools and cables were mounted on the hull. 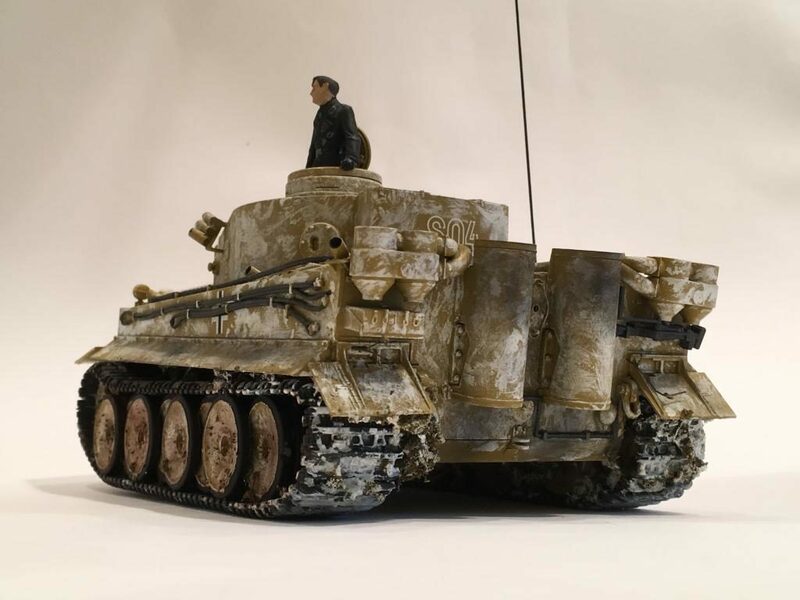 I painted this one using Model Master “Dunklegelb” spray from a rattle can. Then I simply brushed on flat white over the top of the dark yellow base coat following the kit instructions. 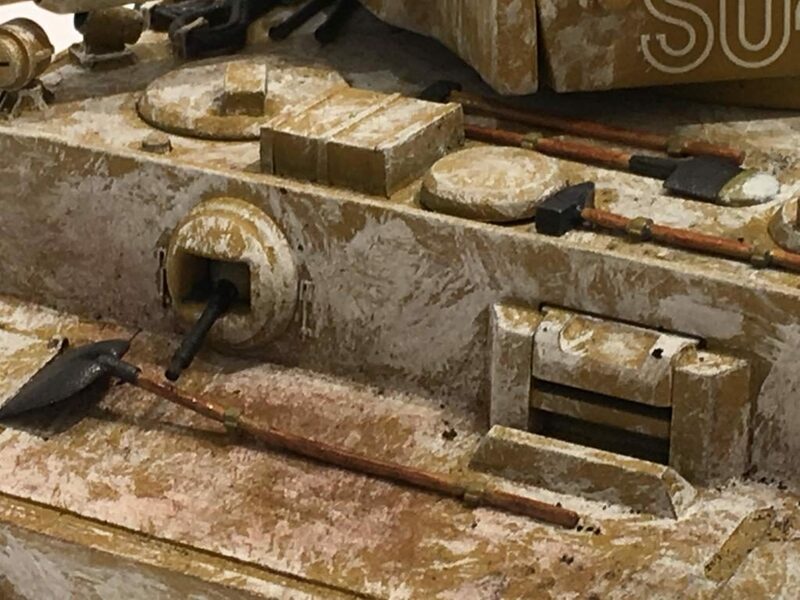 The kit decals including the victory markings on the main gun barrel were used as well. The “snow” was simply white glue and fine sand, mixed in with some flat white paint. Once I achieved the mud like consistency, I brushed this home brewed mixture onto the tracks, under the rear fenders and sporadically on the suspension. I then added a few twigs to make it look like natural vegetation was caught in between the track cleats. The final details were dry brushing on pastel chalks for the exhaust staining and “dirt”. 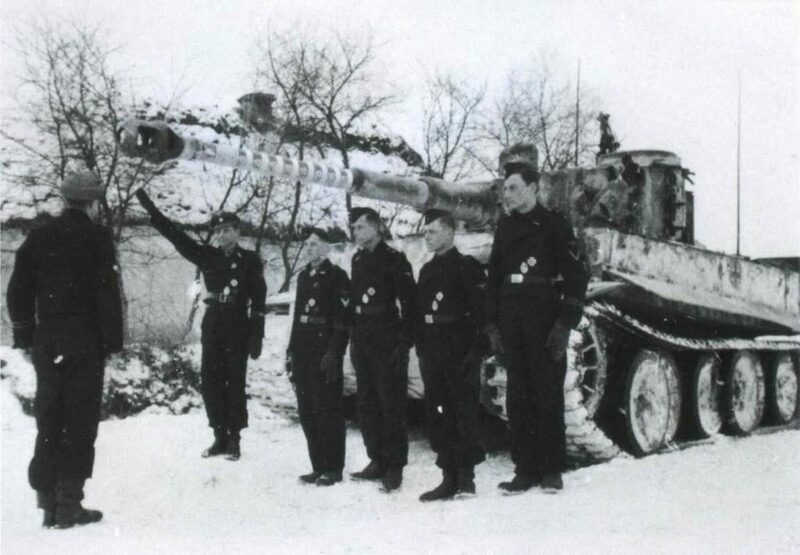 Michael Whittmann received the “Knights Cross of the Iron Cross with Oak Leaves” personally from Hitler, for the destruction of 117 enemy tanks. Most of the kills were on the Eastern Front. 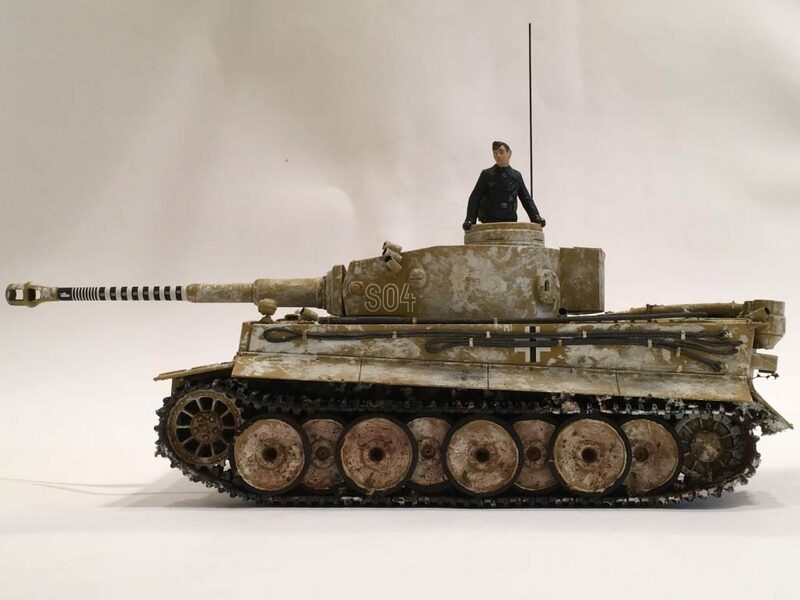 A few kills were made when he was in a Stug III and Panzer III medium tank. This medal was received on February 2nd, 1944, at Hitler’s “Wolf’s Lair”. His eventual score was about 135. 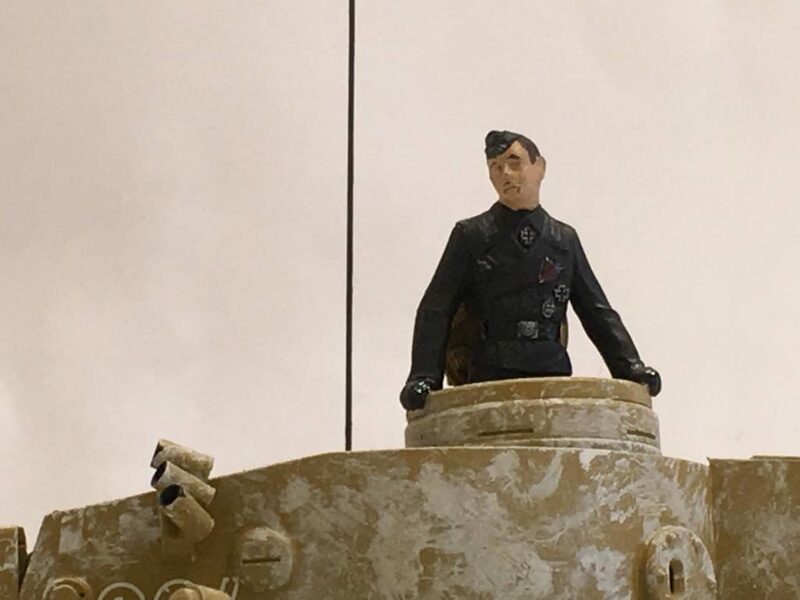 Most of his victories were scored while Commanding a Tiger I.
Whitmann was later killed at Villers Bocage, in Normandy, France, later that same year on August 8th, 1944. He was killed in a Tiger tank number 007. I have included a photo of 007 at the end of the pictures. This picture was taken a year later after the War had ended. 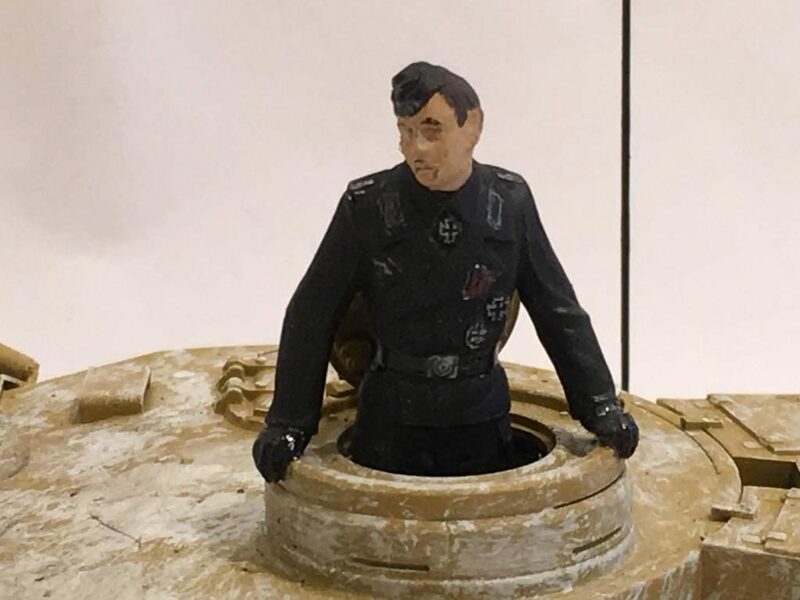 The turret has been blown off by an internal explosion. It is lying some distance away from the hull. This should give you some idea about the force of the blast. 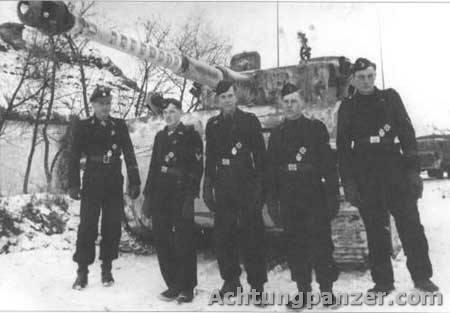 There is controversy about who or what unit destroyed the tank he and his entire crew perished in. Louis, Good looking Tiger !. I also enjoy your write up. Good stuff all around. I have to admit, I like Tanks ! Thanks Terry. I’m glad you found this one interesting……….. 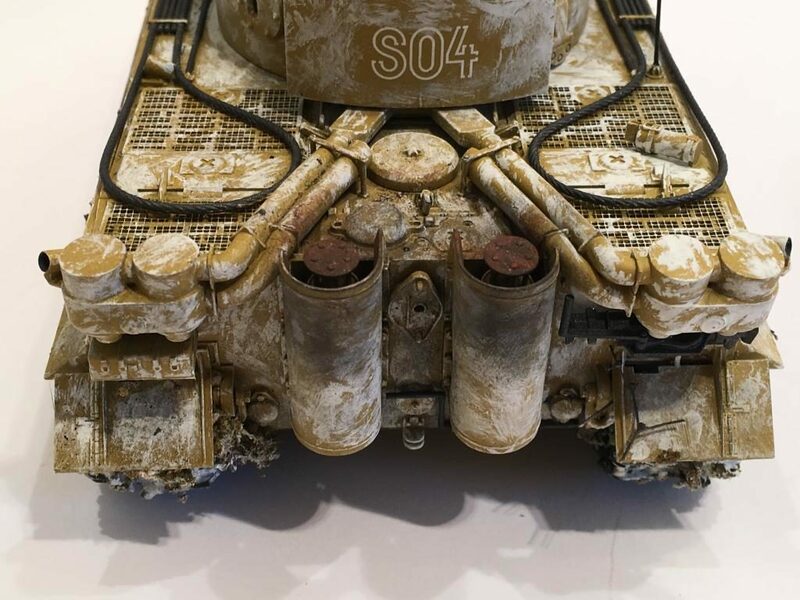 I like tanks too…………….. Very interesting! Fans of Rowan and Martin’s Laugh In may remember this………. the funny little guy on the tricycle………….. hiding in the bushes………… wearing glasses…………….. good stuff. Arte Johnson (yes….I watched it way back when). Me too………. with Dad of course. It’s veeery interesting, but silly, there’s a local station running these shows by me. Sock it to who? When I was in the Army, there was a DOD security poster with Arte on it, wearing his coal scuttle helmet, saying “Security is no laugh-in matter”. One pf my “roomates” modified the word “blow” to “not”. The senior NCOs were not happy. Hey Louis…I, too, like armor. 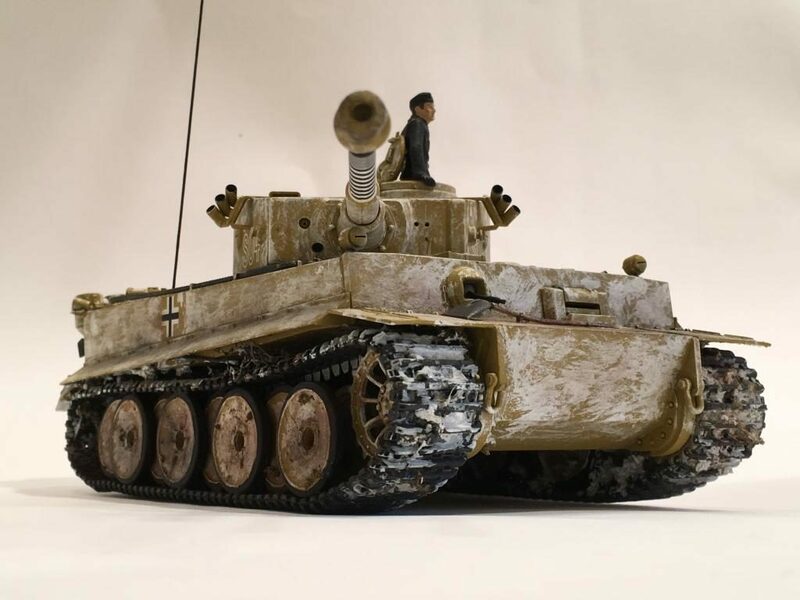 Before I moved to sunny FL in ’85, I had over 40 examples of 35th scale pieces, but found it not feasible to try to take ’em with me (gave ’em all to another armor modeler). If I only had all the money I spent on models no longer in my possession (sigh). 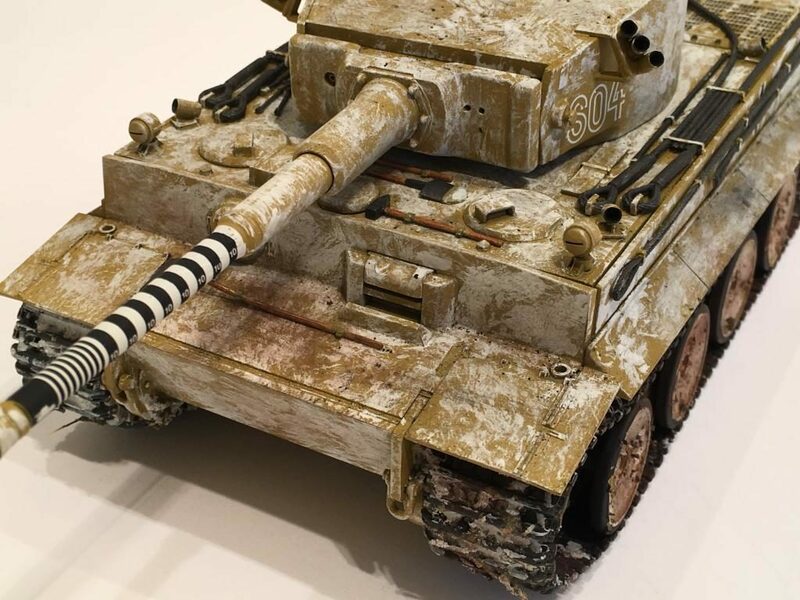 One thing about that Tiger tank I noticed…I would have been just as aggressive with those splotches of [white?] camo when I came to the markings and painted right over ’em (not heavily, of course, but it’s obvious they were “spared”). BUT….perhaps the soldiers applying it were instructed NOT to cover ’em for all I know. Anyway, nice work – I like it. Thanks for the compliments Craig. I have spent a lot of money on this hobby too over the years. Probably way too much. But it’s a fun pastime for me so I use that as an excuse. I have an excellent series of books called “Panzer Colors” that came in three volumes. 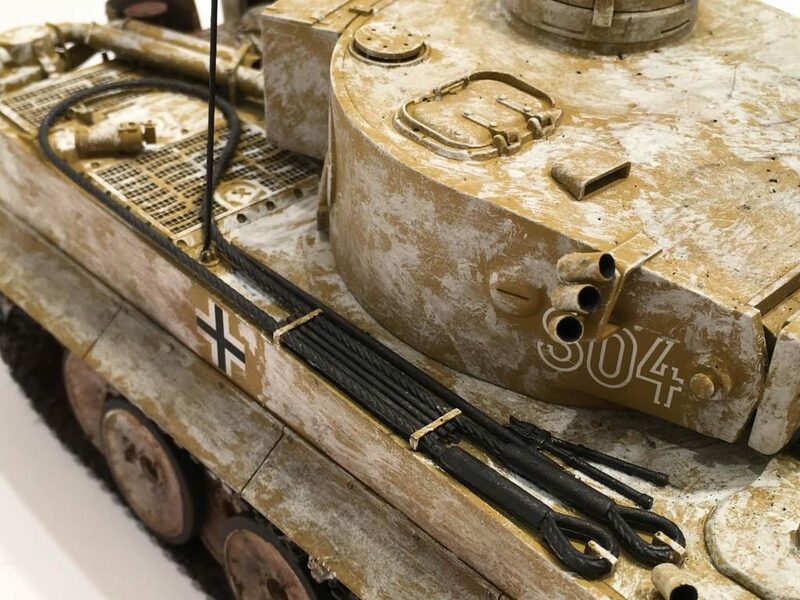 It covers camouflage patterns in detail and even has a great amount of information on unit markings. 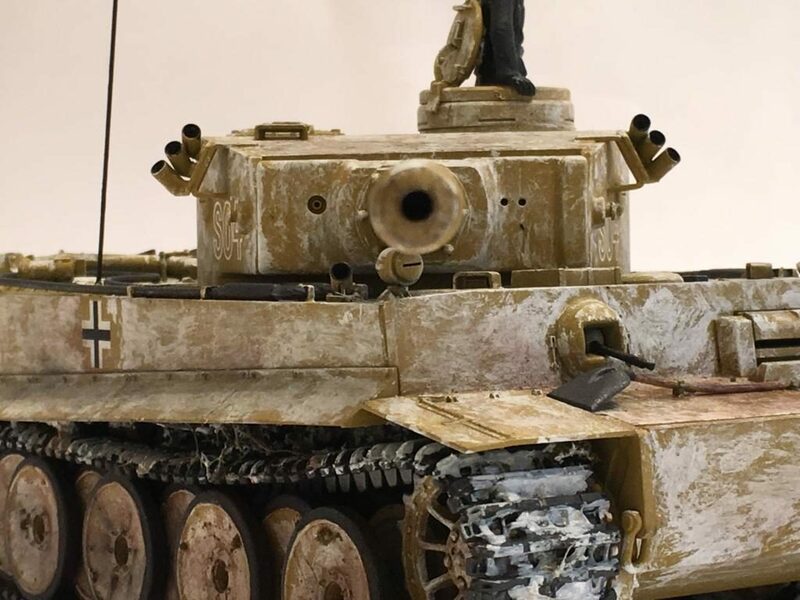 Most of the time the crews were in a hurry to get the painting done, so any means necessary was used to apply the camouflage. Sometimes they even used mud, and smeared it on by hand !!!!! The crews would use brooms, mops, rags, paint brushes etc. to get the job done. Depending on how much paint was available, the time allocated for the job and the tools available often dictated how the job was done. The three primary colors (besides white wash) were delivered in a paste form. 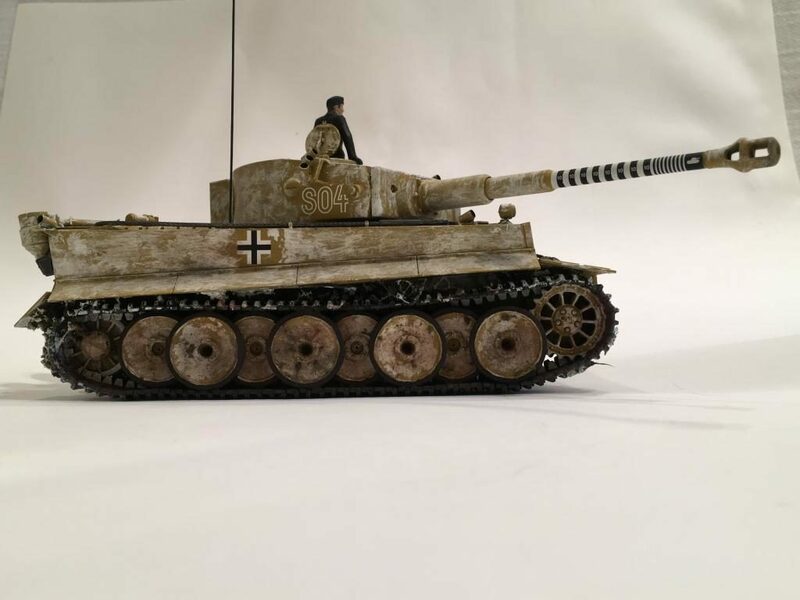 I’m talking about the dark panzer yellow which was mainly used as a solid base coat as the tanks were built, and the green and brown colors. 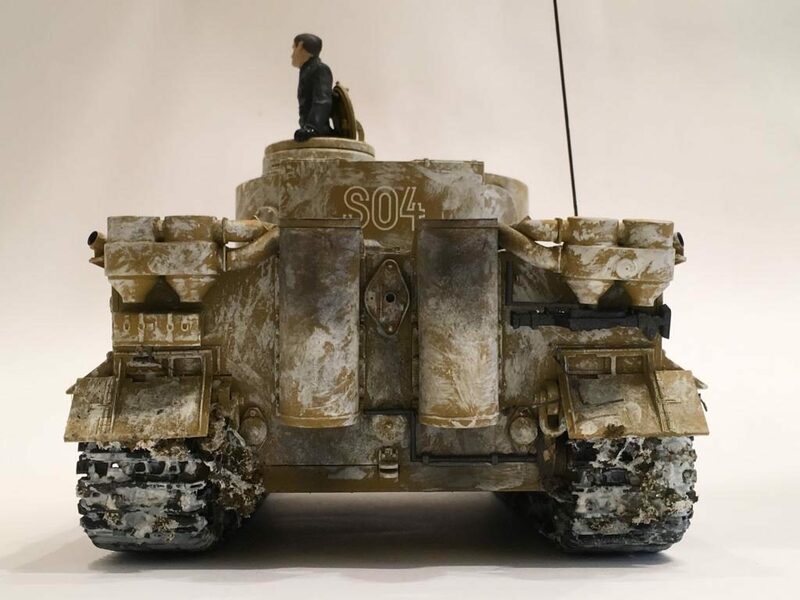 The crews used whatever was available to them to thin the colors so they could be applied to the tank for camouflage. The crews used water, gasoline and even sometimes used motor oil to dilute these pastes for application. Crazy stuff !!!! 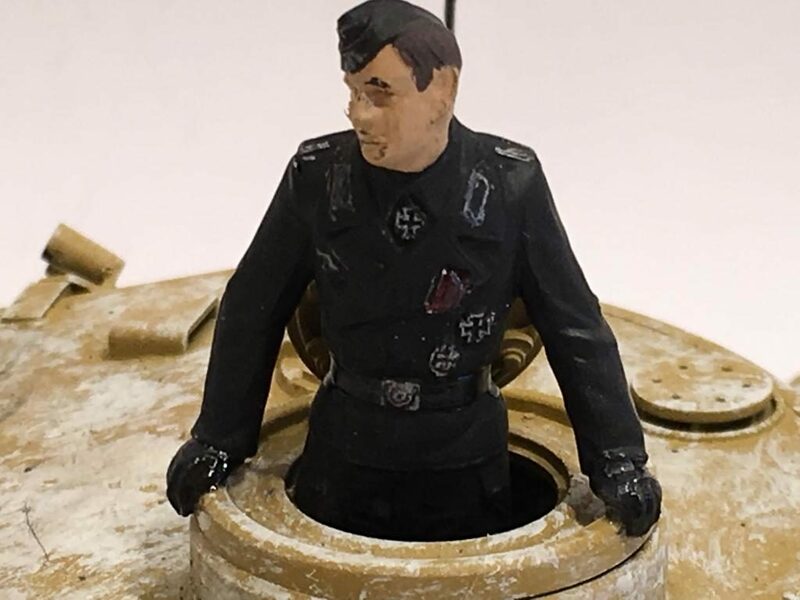 That’s why I really don’t get too crazy with trying to match the “exact” color with mid to late War German armor builds. 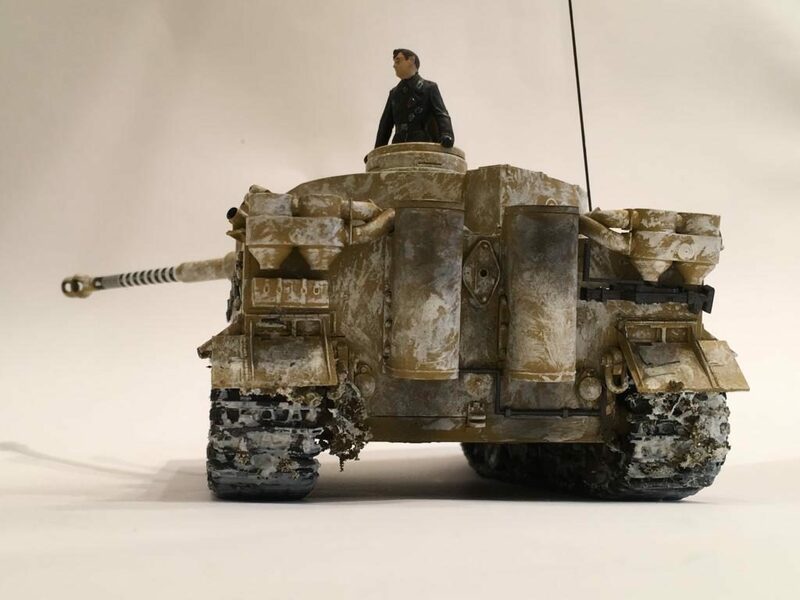 PS: There were times when the tanks were spray painted with camouflage too. Sorry to hear about how you had to give away your armor collection. I can understand it though. I still have a Soviet SU-152 that was given to me by a friend who had to move and couldn’t take it with him. Take care. For Winter schemes, they used whitewash and even real snow. I’ve got two of those squadron signal panzer books. Using mud as a paint struck me as good thinking, and leaving the dust on. A slurry of crushed chalk or white pastel would give the whitewash effect. No need to be neat, either. Make a rivet counter twitch! Maybe drop his pocket flashlight! I saw the one that had the front covered with chalk squiggles. 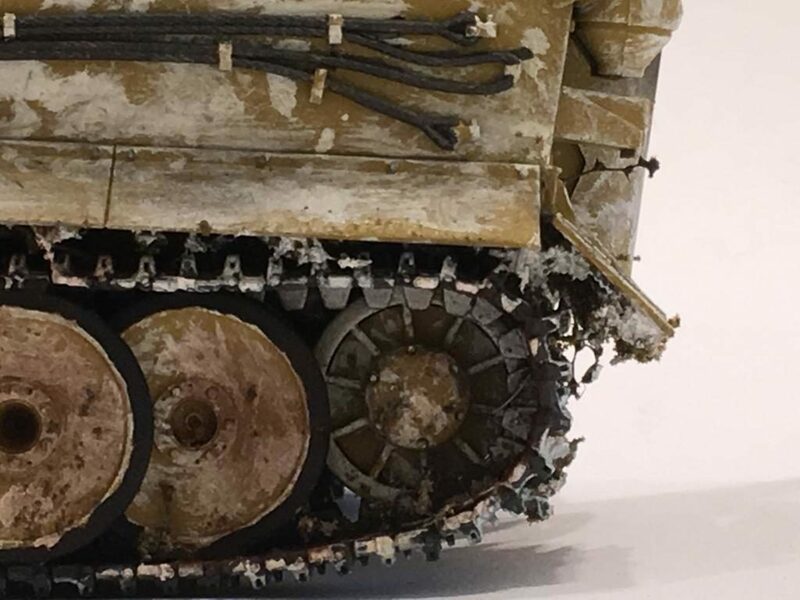 I think that it was a Panzer 4. 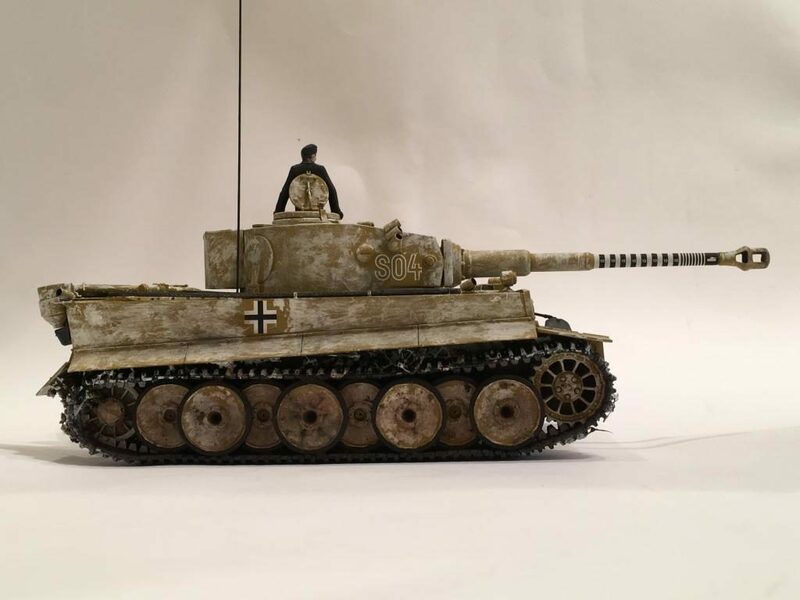 It’s a great resource for German armor builds. Still a great kit despite its age, which is not that old! Thanks Rob. It was a nice building kit I might add. The fit was perfect throughout. Cracking build, Louis. A Tiger in the most striking markings. Love your armor builds, mate ! I hear you my friend. I too need to get busy with my builds for Midway. Thanks for the compliments. 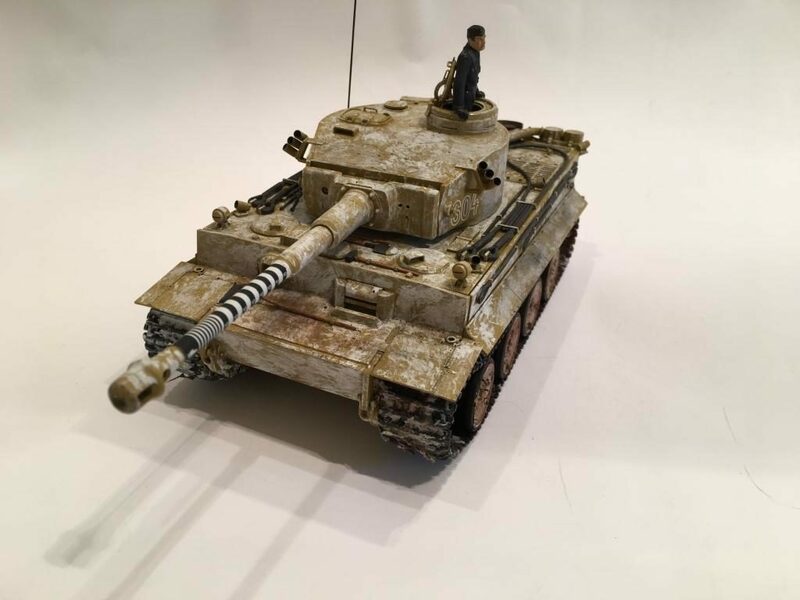 According to “Great Tank Battles” a Sherman firefly took out Whittmann. The poster boy of the Nazi party. His last mission or combat your left with the feeling that Whittmann was on a suicide mission or he knew he was fainted to not make it back. With a comment about Val Halla to his fellow tankers. 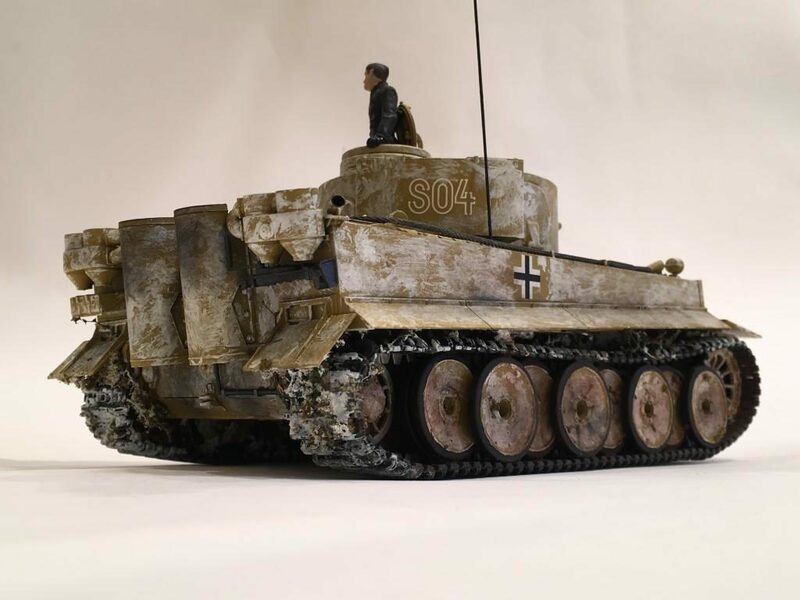 The interviews with the allied tankers is of interest and one chap make no bones about his feeling towards Whittmann. No love lost. My editor did it again. Fainted should read fated. Thanks for sharing this link with us. I really like to watch the series “Greatest Tank Battless”. This looks like a newer episode, one I have never seen before. I will watch more of it later when I have more time. I watched the first 6 minutes or so. I agree that there was no love loss between these combatants. Thanks again. 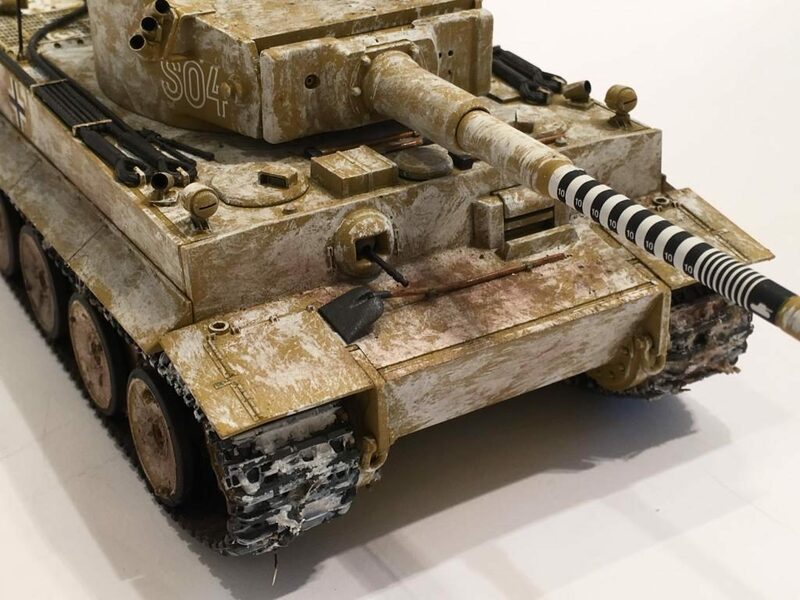 Here is another documentary proving who took out Michael Wittmann. 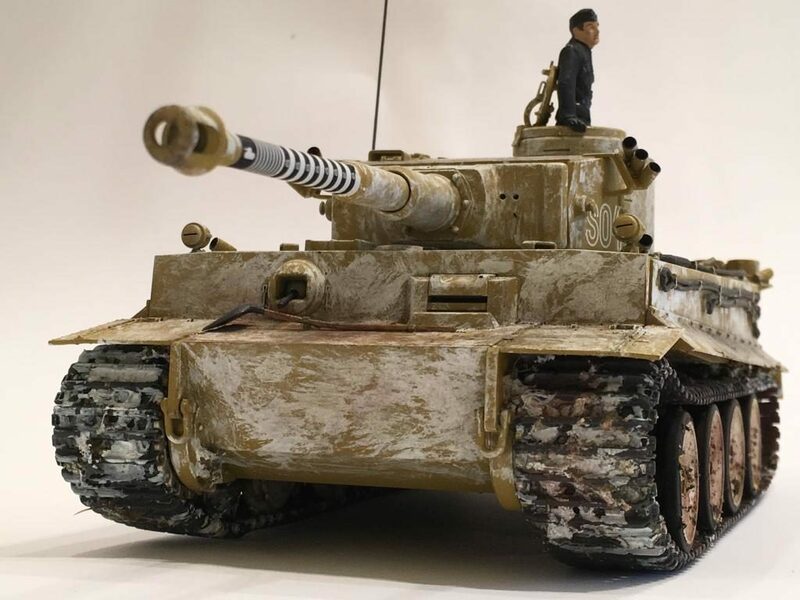 It is more contemporary and uses photography,interviews and surveys to prove which tank unit got Tiger 007. Thanks for sharing this link too. I have often wondered about this. 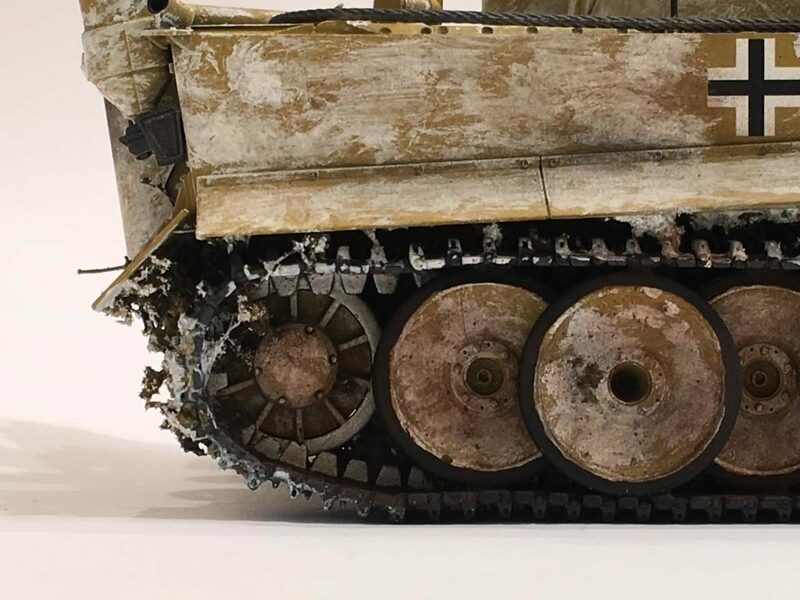 There were some saying that the tank was knocked out by Typhoons using rockets. This was based on unexploded rocket ordnance found nearby. However the RAF supposedly didn’t fly any sorties in this area at the time his tank was destroyed. I’ll have to watch this one too. Thanks again. Ok I guess we’re even. My auto corrector hacked my thumbs. That should say Battles instead of battless. 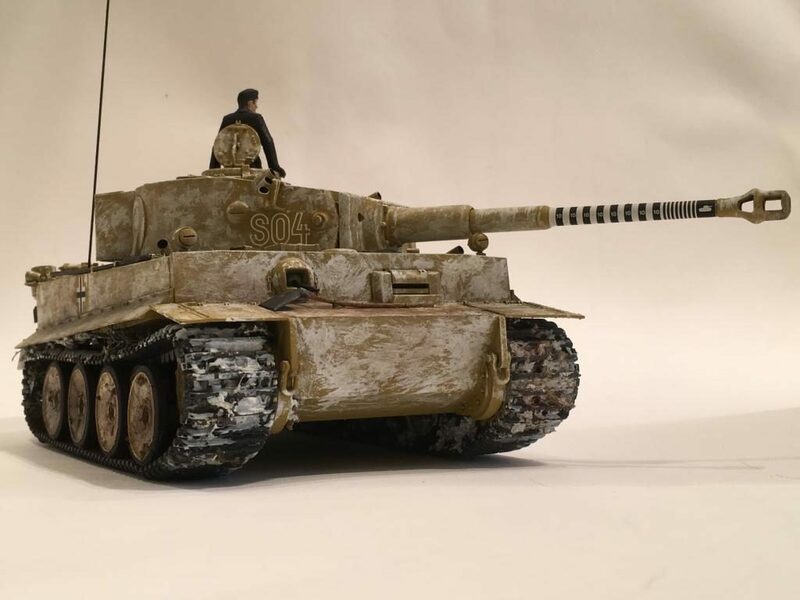 Great job on the Tiger. Thanks Bob. I’m glad you enjoyed it. Wittman has interested me since I first became an Armor crewman. I saw the recently-done program that concluded (or, I’d say proved) that 007 was taken out at about 175 meters by a Canadian Firefly. There were lots of great photos, as you saw. 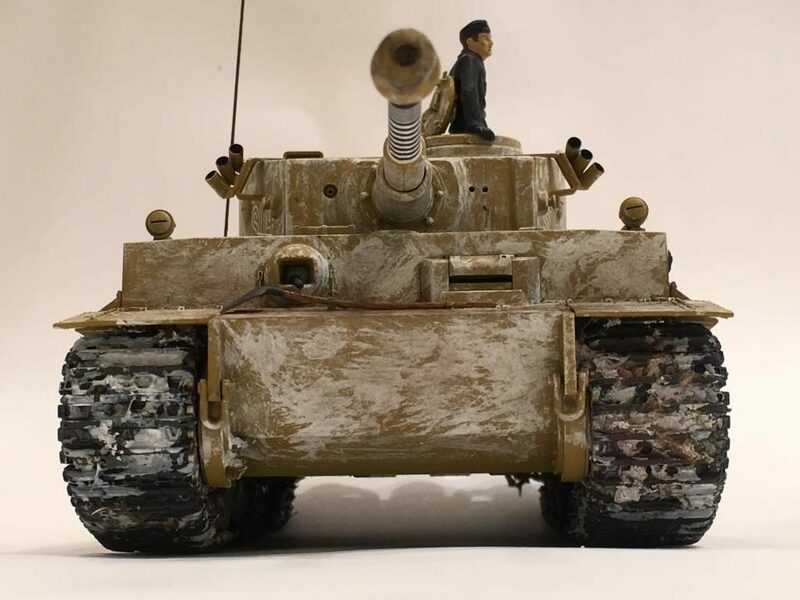 Your Tiger I build is excellent. I hope my M1A1 build is as good as this. 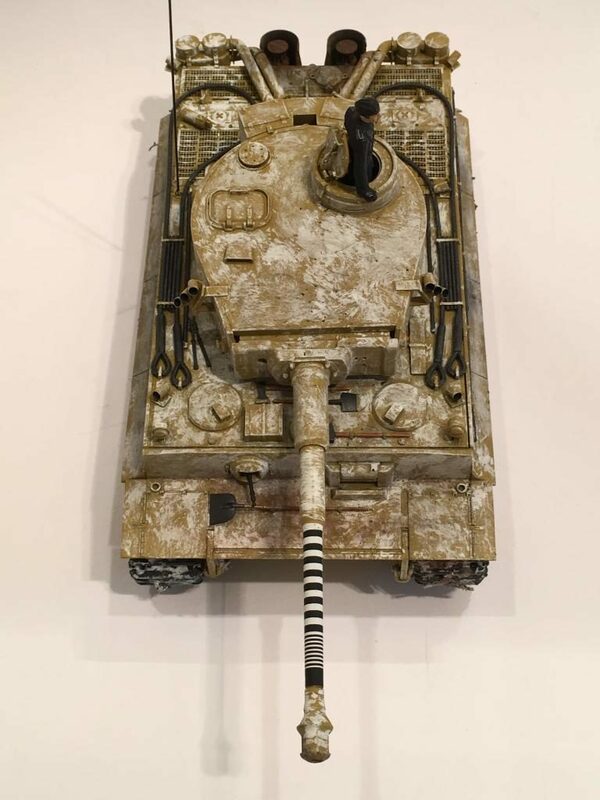 I’m having trouble finding pictures (I have ONE) of our 1/4 Cav tanks in Desert Storm. But enough about my project. Like you I have always been interested in Whittmann’s achievements. I think it’s in our old Tanker DNA to do so. I have yet to watch the show you mentioned. Sounds very interesting. I’m sure that your M1A1 will turn out great. Thanks for complimenting my work. I have a few photos of M1’s at Ft. Knox, but that’s about all. I may have a few from Reforger 83 too. I think the Abrams were part of “Blue Forces” when I was over there. Since I was in the 3rd Cav we were part of the “Yellow Forces” and had large yellow triangles on our vehicles. If you get the chance, and you want to, why not post up some pictures of your M1A1 in the Armor build section ??? 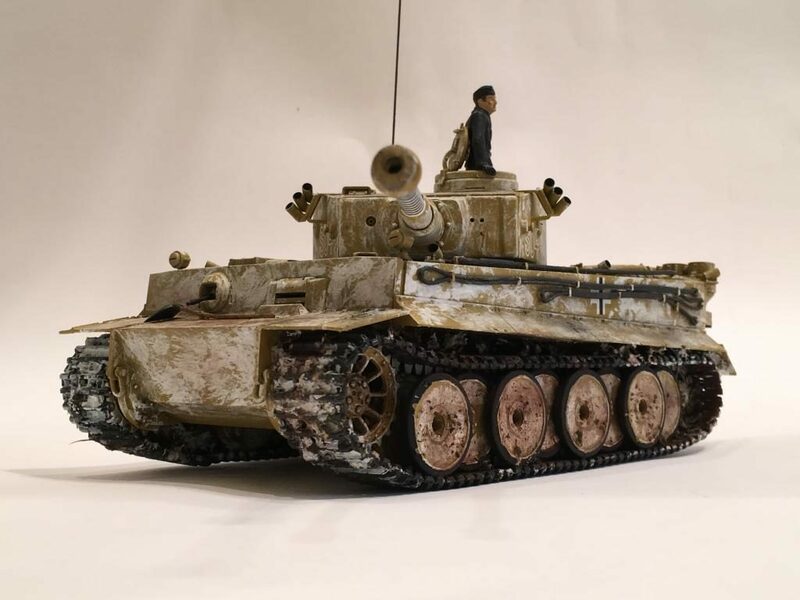 If you do then I’ll post some of my Early Panther D build and my M-60A1 that was modeled after one of my old tanks.